The Noetics are an all instrumental Ozric Tentacles influenced band from Germany. 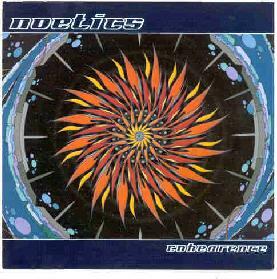 I reviewed their first CD, Noetics, for the Oct 2000 Aural Innovations. The band have produced a fantastic follow up recorded in Dolby surround sound! The CD contains 12 tracks as well as a multimedia video of about 4 minutes of a live concert. The band have greatly matured in the past two years and I think the playing by the band, especially the guitar playing has improved. The band is six members, guitar, bass, drums, synthesizer, tablas and percussion. The opening track, "Miraculix", could easily be mistaken for an Ozric Tentacles song. The band are just getting warmed up though and use the synthesizer lines in a different way than the Ozrics and as the CD develops, it truly takes on it’s own, more jazzy flavor. "Raumnacht" begins with some jazzy keyboards and flute, before the bass line kicks in and takes off. The band build up the song based on the keyboards. While in the Ozric Tentacles Ed is the center of the band, in the Noetics it is the fantastic synth playing of Ole that the band builds its songs around. "Bossa Supernova" is short 2½ minute mostly synthesizer piece. "The Dude" is a very jazzy song and probably the song that would be played on the radio of any song on the CD. It also features a guest sax solo and excellent jazzy guitar solo. Mind, the Gap, is basically a piano jazz piece and very well performed. "Gunsch!" is another Ozrics inspired track with some nice guitar soloing and keyboard interplay. "Flugbereiter" starts with some great synth sounds and then the bass line and percussion take over the sound and more layers of psychedelic synthesizer are played over the top. Very Ozrics inspired but not as electronic sounding, more organic than the Ozrics. "Der Schleicher" and "Bothfeld Skyline" are both very jazzy numbers that have a lot of similarities. Cool stuff. The CD closes with "Element 105", a very laid back Reggae-Dub inspired space music composition. It is a pleasure to have more bands playing this style of instrumental jazz space rock and the Noetics have produced a fantastic CD that will please all that hear it. For more information you can visit the Noetics web site at: http://www.noetics.de.